Who Owns 73% Of Our Debt? At the time, a search through the RBA’s Statistics tables (“E3.xls”, Commonwealth Government Securities Classified By Holder) proved Gittins wrong. We found that at September 2009, $65.972bn in Commonwealth debt was estimated to be held by non-residents. From a total of $104.228bn. In percentage terms, an estimated 63.3% of public debt was actually held by non-residents of Australia. Naturally we posed the question – Who exactly, are these ‘non-residents’ who hold 63.3% (or more?) of our public debt? Magenta - Total Public Debt. | Blue - Non-resident holders. 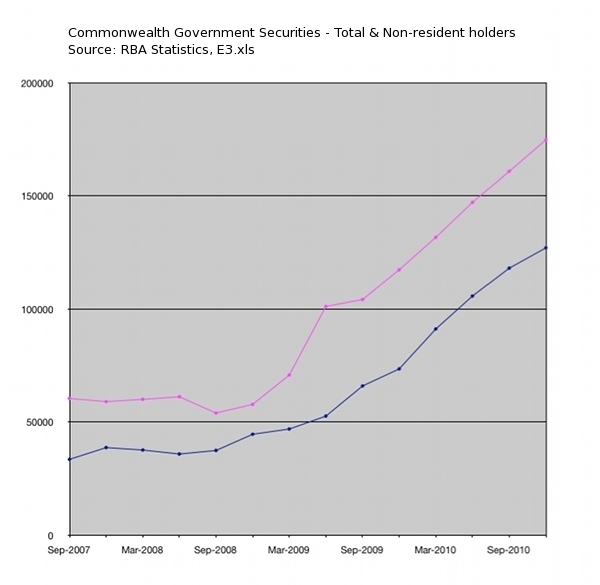 According to the updated RBA spreadsheet (“E3.xls”), at December 2010, $127.027bn in Commonwealth debt was estimated to be held by non-residents. From a total of $174.794bn. In other words, at December last year we owed $174.794bn. And of that, $127bn – that is, 72.6% – was estimated to be owed to non-residents of Australia. We ask again – Who exactly are the ‘non-residents’ who now own 72.6% (or more?) of our public debt?